Home Starting a Business Motivation So What is Your Why? I believe the reason for so much violence, anger, frustration, suicide, murder, corruption and deviance in the world is because most people have just not connected with what they are really supposed to be doing in life. They simply do not know their purpose. One of my favourite quotes is… “The 2 most important days in your life is the day you were born and the day you find out why”. I am blessed with the opportunity to coach, train and mentor many people from all walks of life. I see this as a phenomenal blessing because it gives me an opportunity to help people answer this question. What is your WHY? I’m convinced that until a person can answer this question they’ll roam around life aimlessly spending money, living recklessly, feeling dejected by the world and believing that life has handed them the worst cards in the pack. Knowing your WHY stimulates, motivates, energises and inspires not just you but others. Knowing your why propels you to wake up every morning and see life through the eyes of optimism, even in the face of personal crisis, loss and failure. So if you’re not feeling like this the chances are, you’re probably not yet in your purpose ZONE. Your WHY rewires you to be successful in life. I count myself successful, not due to the amount of money I have in the bank. I think you’ll agree with me that we could always do with some more of that. But I feel extremely rich because I’ve found my reason for living. My true success comes from being able to see other people’s lives impacted by my story. It comes from the amount of people I can serve by helping them explore their purpose and dreams. It also comes from the deep and meaningful relationships I’m able to build with others along the way. The day I found out my WHY, life began to take on a whole different turn. It dictated my choices, relationships, the value I place on my time and how much I appreciate others. It determined what I put my effort into and the kind of activities I engage in. Life and the world around me, instantly became more purposeful. Does this mean that I live in a constant state of euphoria and never have problems? Of course it doesn’t. But it does mean that knowing my purpose in life helps me to view difficult situations in a totally different light so I can better overcome the hard times. I’m not a believer in chance. I believe everything, I mean everything that happens to us is for a specific purpose. Even if it’s not our fault I still believe that there are lessons to be learned from every life circumstance. I believe you’re reading this post for a reason. Either you haven’t yet discovered your why. Or maybe you have but this post is just acting as reassurance that you’re on the right track or maybe you want to refine your purpose a little more. Wherever you stand in life at this point. My questions to you today is… “What’s Your Why?” What is the thing that you wake up thinking about and go to bed thinking about? What drives you? What are you going to be doing differently in the coming year to make an impact on others and the world around you? These are questions that we need to be able to answer so that we can live a fulfilled life. 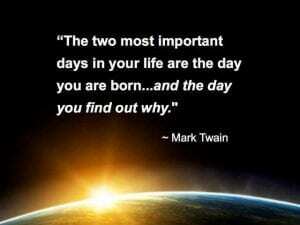 I can attest to the fact that the day you discover your Why is the second best day of your life!